Several recent news articles have discussed tariffs on U.S. agricultural exports and the impacts these policies are having on global commodity markets. As the effects of trade policies ripple through the agricultural sector, a separate set of news items have highlighted how politicians and farmers are reacting to the impacts. Today’s update provides an overview of these news stories. 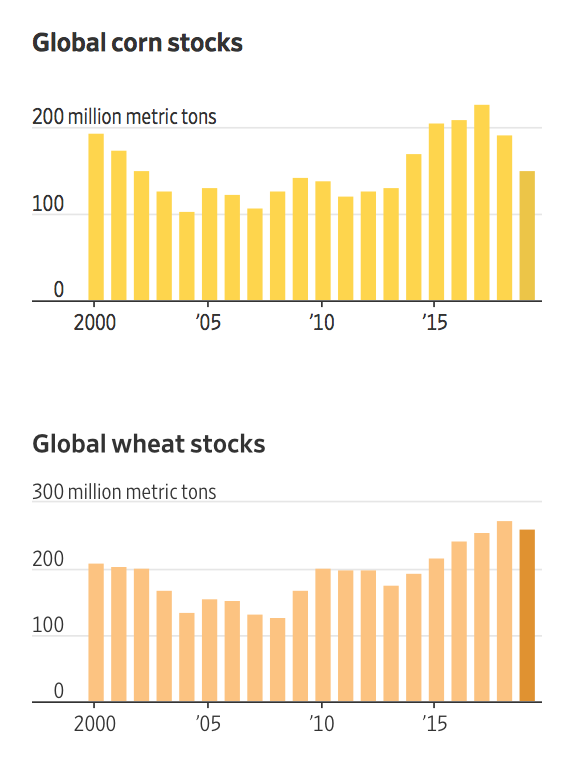 Wall Street Journal writer Benjamin Parkin reported late last week that, “Gluts of corn, wheat and other crops are finally easing after years of oversupply, but prices have yet to meaningfully rebound. “U.S. 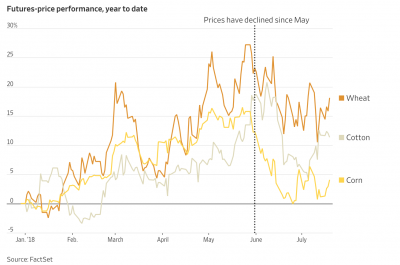 Grain Prices Crunched by Trade Fears,” by Benjamin Parkin. The Wall Street Journal (July 19, 2018). 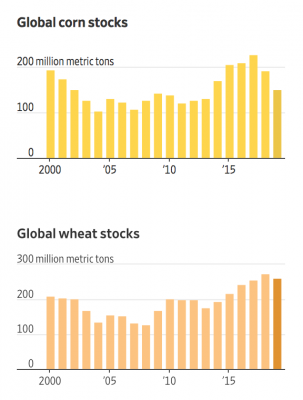 “The enormous stocks of agricultural commodities that piled up around the world in recent years are due to start falling, the U.S. Department of Agriculture says. A combination of robust demand for grain to feed to livestock and droughts from Kansas to the Black Sea region have helped chip away at record oversupply. That has done little to bolster prices, however, leaving some analysts scratching their heads. Hedge funds and other investors instead have focused on the prospect that tariffs on U.S. agricultural goods levied by China, Mexico and others could kill demand, erode market share and leave American farmers sitting on even larger surpluses. “Analysts say traders are taking their cues from soybean prices, which fell to near 10-year lows this month. China is the largest buyer of American oilseed. 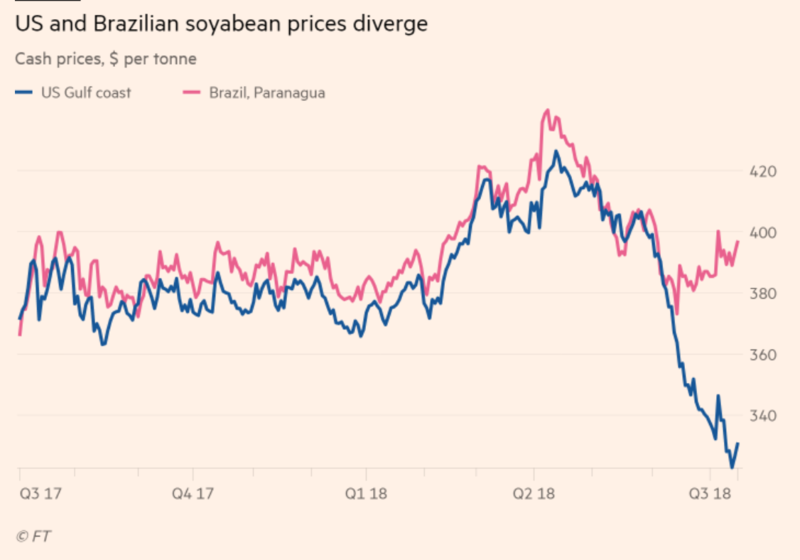 The duties of 25% already have the country’s grain merchants buying more soybeans from Brazil, but the agency says higher costs will force some to cut back on oilseed consumption. Chinese imports are expected to fall as a result, pushing up domestic and global supplies next year,” the Journal article said. 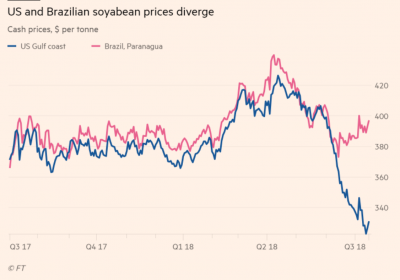 “US-China dispute sends Brazilian soyabean premiums to 4-year high,” by Emiko Terazono. The Financial Times (July 18, 2018). “The premium is the highest since September 2014 and comes as Chinese buyers have been cancelling their US orders as the 25 percentage point tariff increase by Beijing on US soyabean imports took effect this month,” the FT article said. “Hi everybody. I am a #soybean”. China, which in 2017 bought about $839 million worth of U.S. sorghum, has not purchased significant volumes since February, according to U.S. Department of Agriculture data. 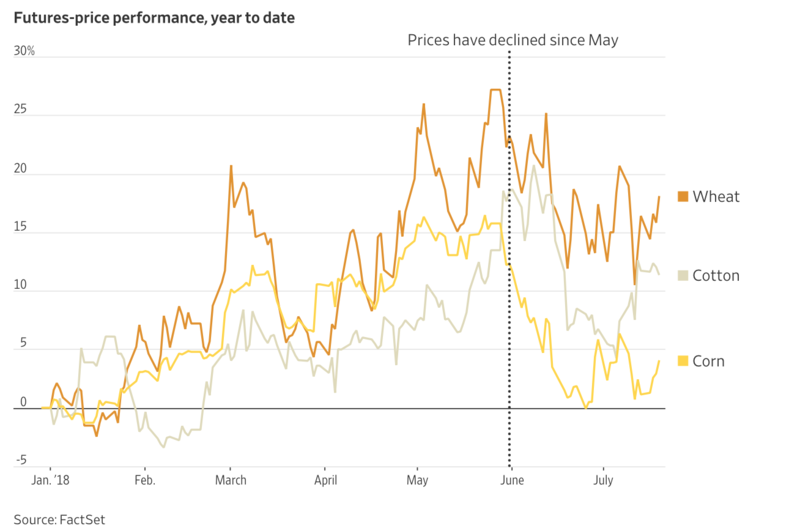 Tensions have been high since China launched an anti-dumping probe of U.S. sorghum in February, though it dropped it in May. “Sorghum farmers in coastal Texas are among the first growers to harvest crops since the world’s two largest economies started announcing tariffs on each other’s goods, leaving them scrambling to find buyers,” the article said. However, Bloomberg writer Megan Durisin reported later Friday morning that, “President Donald Trump on Friday blamed a plunge in U.S. soybean prices on ‘bad (terrible) trade deals.’ Mother Nature is really the culprit. Meanwhile, Associated Press writers Steve Karnowski and Blake Nicholson reported last week that, “Many anxious American farmers are delaying purchases and investment while hoping for a truce in a U.S.-China trade war that has left their crops at a competitive disadvantage overseas. But recent reporting from Bloomberg’s Alan Bjerga suggests that from a political perspective, many farmers are sticking with President Trump- at least so far. (See clip below). Similarly, Des Moines Register writer Donnelle Eller reported in article that was published on the front page of Sunday’s paper that, “The clock is ticking as Republicans work to hold the support of farmers, a group that helped push President Donald Trump to victory in Iowa and the nation two years ago. With the midterm election just four months away, that support could determine whether Republicans keep control of statehouses, governor’s offices and Congress. So far, farmers and GOP leaders say ag country mostly supports the president’s quest for better trade deals with China, Mexico, Canada and other major trade partners. And The Wall Street Journal editorial board stated in Saturday’s paper that, “Meanwhile, White House trade adviser Peter Navarro told CNBC on Thursday that the damage from the trade war so far is no big deal. ‘We got two economies that add up to around $30 trillion in annual GDP. The amount of trade we’re affecting with the tariffs is a rounding error compared to that,’ he said. That drew a sharp rebuke Friday from the American Farm Bureau Federation that has watched retaliatory tariffs hit U.S. agriculture especially hard.